Back in April, I wrote about our timelapse project at The Nature Conservancy’s Niobrara Valley Preserve. Working with Moonshell Media, we’ve got nine cameras set up around the Preserve to document changes over time as the site recovers from a major 2012 wildfire. We only have photos from April through early July so far, but even those are very compelling. Eventually, we’ll put together videos that will show the entire timelapse story from each camera, but I wanted to share just a few examples of what we’re seeing so far. I’ve selected two images from each of three cameras to give you a taste for the kind of stories we’re getting from the cameras. 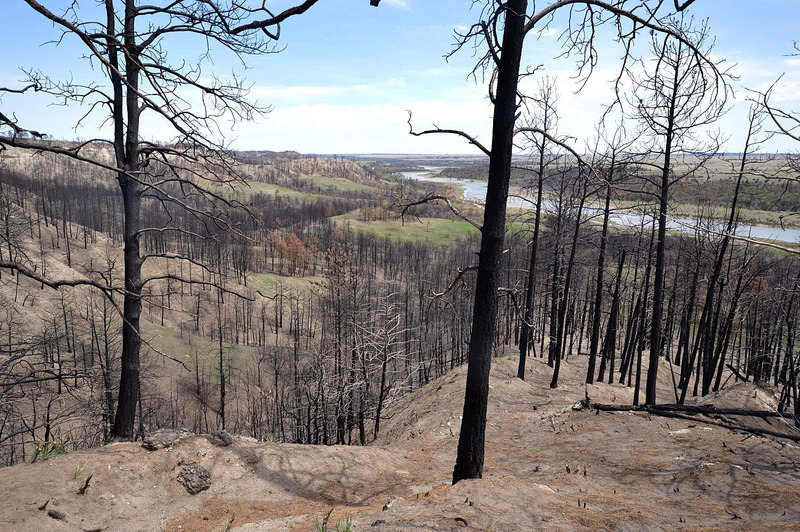 The first pair of images is from the north ridge of the Niobrara River where the wildfire wiped out our ponderosa pine woodland. 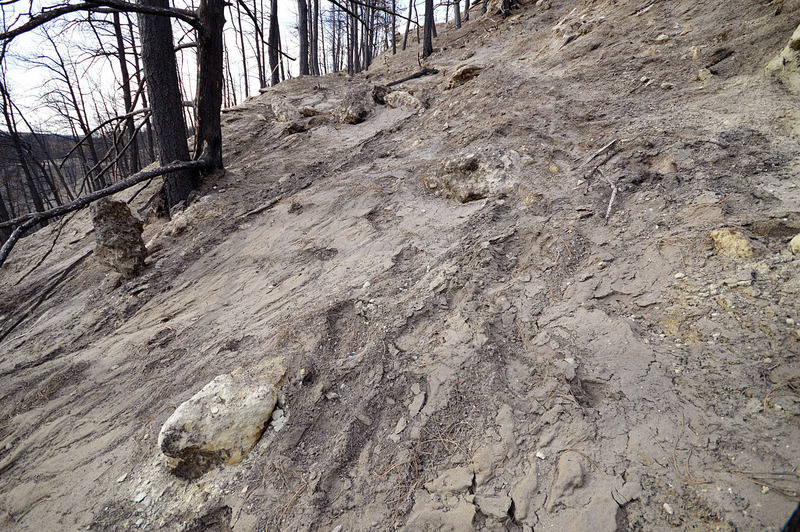 We set up a camera to capture a close-up view of a steep slope. Overall, erosion is not as bad as I’d feared it might be, but there was some significant soil loss during the first several months of the 2013 growing season, especially on steeper slopes like this one. This photo was taken on April 28, 2013, shortly after the camera was installed. In fact, you can see some of our footprints in the loose soil in front of the camera. Note the location of the rocks in the image – particularly the tall one in the top left quarter of the photo. The pine and eastern red cedar density had been high in this location prior to the wildfire, and few perennial plants were able to grow in the shade beneath them. Because of that lack of established vegetation and the steepness of the slope, we expected to see significant erosion here. This image was taken on July 21, 2013. Some of the rocks from the previous photo have washed downslope and out of the frame. Others have become much more exposed as soil has washed away from them. Annual vegetation is starting to fill in the bare areas, but is still spotty, and very little – if any – perennial vegetation (grasses, forbs or shrubs) is evident. We had some undergraduate students from the University of Nebraska-Lincoln collecting data on soil erosion and water runoff/quality this summer. They are still analyzing data, but it’s clear that erosion was highly correlated with tree density, especially that of cedar trees. 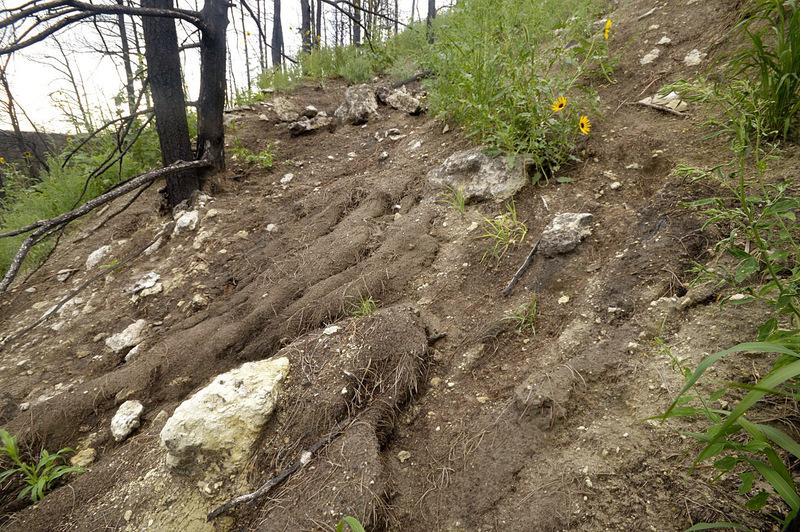 Where the density of cedar trees was high before the fire, very little perennial vegetation grew beneath the trees, so those areas were the most prone to significant soil erosion after the fire. The good news is that there is still sufficient soil to support vegetation growth, and there are numerous patches of perennial grasses and other plants nearby that can colonize these areas over time. The next pair of images shows a broad landscape view of recovery through the early part of the growing season. Just as in the first pair of images, annual vegetation can be seen colonizing the bare slopes. If you look carefully at the top right quarter of the photo you can see that the sandhills prairie and woodland along the south side of the river is greening up very well. The woodland on that side of the river only burned intensively in a few places; for the most part, flames stayed low to the ground and didn’t impact the trees on the relatively cool, wet north-facing slopes. Looking downstream from the north ridge on May 24, 2013. Some green can be seen in a few areas in the distance, mostly where tree density was low and native sedges and other grassland plants were coming back after the winter. Much of the rest of the landscape is pretty barren. The same scene on July 3, 2013. Annual vegetation has colonized much of the landscape, especially where topography was less steep and tree density had been lower prior to the fire. The landscape looks lush and green in the distance, but much of that is made up of those short-lived colonizing plants, so there is a long recovery period ahead before perennials take their place. The future of ponderosa pines on this ridge is pretty bleak for the next several decades. A few pines survived at the very top of the ridge, but colonization from those and other locations will likely be very slow. Over the next decade or two, we hope to see grasses spread back across the slopes north of the river. Those grasses will be important because they will allow us to use prescribed fire to control the eastern red cedar trees that will also be colonizing the same area. If we don’t get sufficient grass growth, we’ll have to find other ways to control cedars, which could prove to be very difficult on those steep slopes. The third pair of images comes from a camera mounted about 15 feet in the air above the sandhills prairie south of the river. The camera is pointing straight down at an 8 foot by 10 foot patch of prairie that burned in the wildfire last year. I am really looking forward to watching this little piece of grassland change over time – not just as it recovers from the wildfire, but also as it responds to future prescribed fires, bison grazing, and weather changes. For now, these two images show how well the prairie plant community rebounded quickly between late April and early July, 2013. This first photo was taken on April 26, 2013. There was a little fall regrowth after the late July fire, but the ground was nearly bare through the long winter. This photo was taken a little more than two months later, on July 2, 2013. 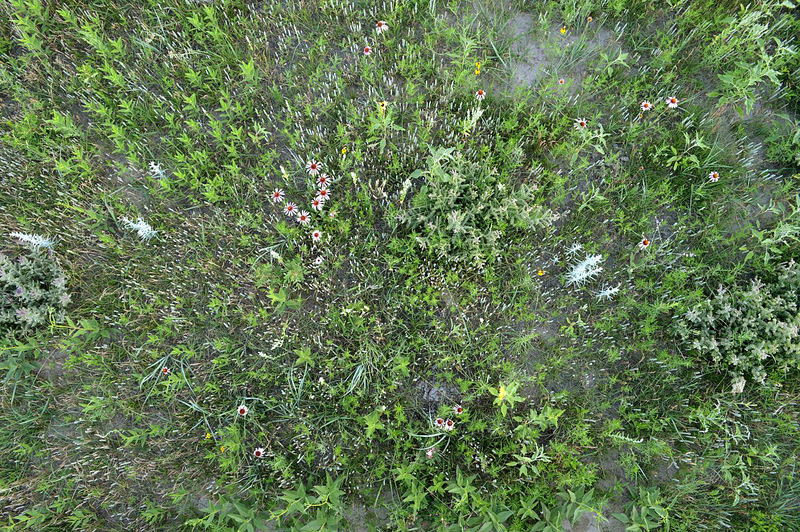 The second of the two prairie images shows a wide diversity of plants growing vigorously within the 8×15 foot frame of the photo. There are two grayish-colored plants of leadplant (Amorpha canescens) on the left and right edges of the photo, numerous purple coneflower (Echnicea angustifolia) blooming throughout the frame, and a few yellow coneflowers (Ratibida columnifera) as well. 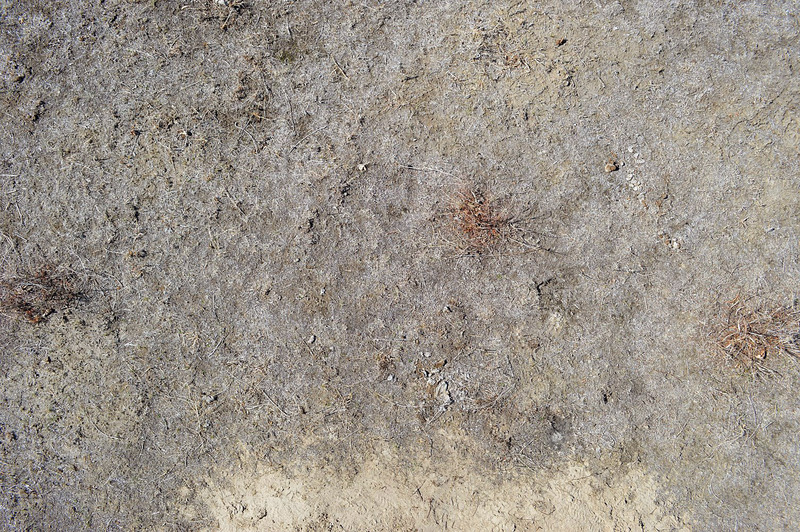 The small silver-colored spikes throughout much of the image are wooly plantain (Plantago patagonica), an annual plant that is often abundant in sandy prairie after fire or grazing events. The larger silver plants are white sage (Artemisia ludoviciana). There are two species of sunflower in the photo as well, including stiff sunflower (Helianthus pauciflorus) and plains sunflower (Helianthus petiolaris), though neither was yet blooming by July 2. I’m not sure what the blueish green grass in the photo is, but my best guess is switchgrass (Panicum virgatum), which is joined by several other grass species I can’t yet identify from the photo. It should be fun to watch plants move in, out, and around the frame over the coming years. Some, such as leadplant, should stay relatively stationary through time, but others -especially plants such as stiff sunflower and white sage, which can reproduce through long rhizomes – should move around quite a bit. After the area has not been burned or grazed for a year or two, grasses will begin to dominate the frame and most of the shorter-lived plants will decrease in abundance. However, when we burn the site again, bison will graze the area pretty intensively, knocking the vigor of perennial grasses back, and allow opportunistic plants such as annual sunflower and wooly plantain to rise up once more. It’s one thing to track that kind of community change with data, but it will be much more interesting to see it visually. There will be much more to come from these cameras! While it’s useful to see paired images that show how things look differently a few months apart, videos of numerous images showing incremental change over long periods will be much better. Those will be put together when we have more images and time to assemble the videos. Stay tuned! 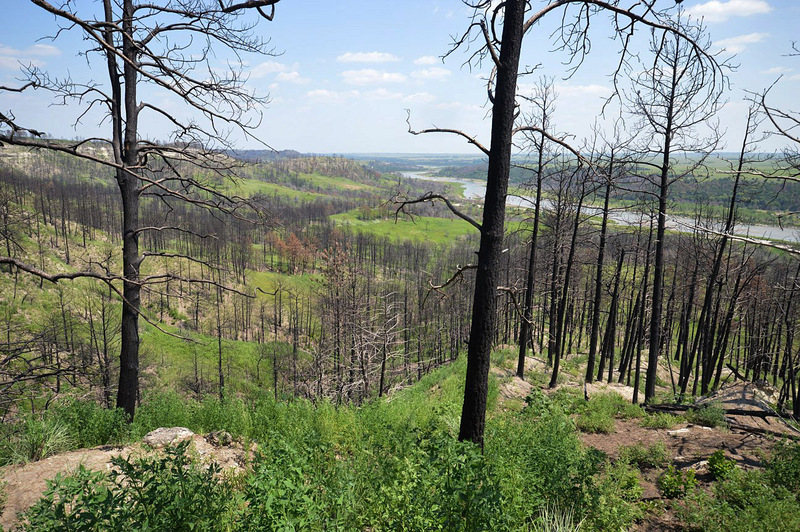 This entry was posted in Prairie Management, Prairie Natural History, Prairie Photography, Prairie Plants, Uncategorized and tagged change, erosion, grassland, michael forsberg, moonshell media, nebraska, niobrara valley preserve, photo, plant community, prairie, sandhills, timelapse, timelapse photography, wildfire recovery by Chris Helzer. Bookmark the permalink. Arctic ice is reduced. You are probably aware that Fairbanks average temp was greater than what we had in Minneapolis this early summer. Lots of trauma and change in the works. These changes will not be easy on any of us. This is a great project Chris. Interesting – I haven’t heard from anyone else about this. Try clicking on the title of the post in your email so you can read it from the actual website. Thanks for letting me know. This is just when you read it within the email? If one of you could forward the email you got with the post in it (I don’t get them…) I’d appreciate seeing it. Just send it my email address (it is chelzer@tnc.org). thanks! Thanks for the sneak preview, Chris! Looking forward to seeing the video! If you scroll to the bottom of the original email and click on “See All Comments”, you should then be able to view and read all of the captions in their entirety. Great stuff Chris!!! Hi Chris, Looking at your first picture I wonder if the area in the photo was a trail. It appears that there is a trail berm along the ridge funneling the water into the spot shown by the picture. I have been thinking about your time lapse camera project. I think the aspect that will be most interesting to me is to see how quickly the dead trees decay and disappear. Thanks for sending the pictures and story along with them. As you probably know, the text was cut off on the right side. I just copied it all into MSWord and adjusted the margins to read it all. I look forward to seeing videos!